Preheat oven to 350 degrees F. Lightly grease an 8-inch baking dish. 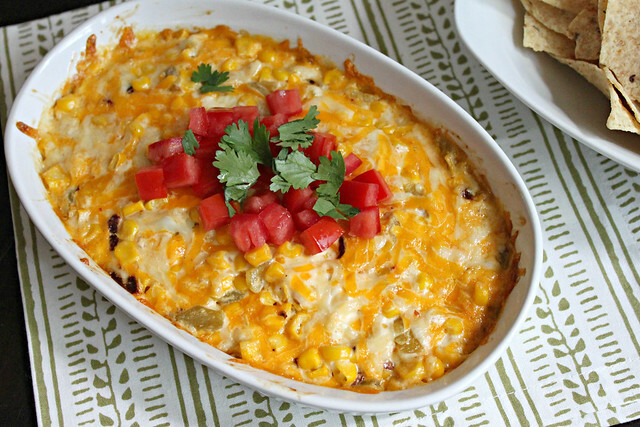 In a medium bowl, combine cheeses, chipotle peppers, green chilies, mayonnaise, garlic powder, and corn. Spread into 8-inch baking dish and bake for approximately 20 minutes or until cheese is golden and bubbly. Top with diced tomato, cilantro, and green onion, if using. Serve warm with tortilla chips.